Few cafes take coffee as seriously – and do it as well – as Dead Man Espresso. With coffee from Seven Seeds (including a special house blend) and single origin beans from other Melbourne roasters, a lot of thought has gone into the cup. Then there’s the serious, modern look of clean lines, timber tables and an impressive balcony area, along with a small but thoughtful menu. 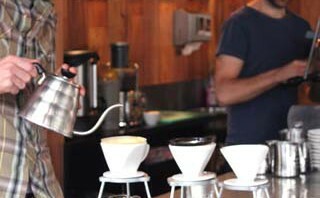 A Synesso machine takes pride of place at the serving area, while the pour over coffee equipment adds a theatrical touch. An inky espresso tastes of unsweetened cocoa and delivers a mouth punch of flavour. It’s intense but balanced and a delight to drink. My latte is creamily elegant, with harmonious flavours playing on the palate. The pour over, an Ethiopian Beloya blend, smacks of aniseed and blueberry; less intense than an espresso, it’s full of flavour but gentle on the palate -and a great exponent of a growing trend. Your CoFfee is second to none! LOVinG Your work! Simply AmaZing!